Debes de hacer un recorrido en slalom evitando conos fijos, No debes tocarlos sino quedas eliminado y conseguir el menor tiempo posible. En las estadisticas tendras tu mejor marca y l mejor marca mundial. - Si eliges 100 monedas ganaras 300 monedas. Para conseguirlo tendra que recojer tres conos azules en 2 minutos. Evita chocar con 2 Buggys perseguidores. - Si eliges 200 monedas ganaras 600 monedas. Para conseguirlo tendra que recojer cuatro conos azules en 3 minutos. Evita chocar con 3 Buggys perseguidores. - Si eliges 400 monedas ganaras 1200 monedas. Para conseguirlo tendra que recojer seis conos azules en 4 minutos. Evita chocar con 5 Buggys perseguidores. Es parecido al Slalom pero juegas contra otro jugador en tiempo real. Tienes que hacer un tiempo menor que tu contrincante. El Tiempo mas bajo de los dos, GANA. Iras comprando buggys cada vez mejores a medida que avanzas en el juego. Cada buggy tiene sus propias caracteristicas que podras modificar en el Taller. En el Taller podrás modificas la velocidad los franos y el Manejo del volante del buggy. b- Moviendo el movil como si fuera un volante. You must make a tour in slalom avoiding fixed cones, you must not touch them but they can eliminated you. Get the shortest possible time. In the statistics you will have your best brand and the best world record. - If you chose 100 coins you will win 300 coins. To get it you will have to collect three blue cones in 2 minutes. Avoid colliding with 2 Buggys persecutors. - If you chose 200 coins you will win 600 coins. To get it you will have to collect four blue cones in 3 minutes. Avoid crashing with 3 Buggys persecutors. - If you chose 400 coins you will win 1200 coins. To get it you will have to collect six blue cones in 4 minutes. Avoid crashing with 5 Buggys persecutors. It's similar to Slalom but you play against another player in real time. You have to make a shorter time than your opponent. The lowest time of the two, Win. You will be able to buy better buggies as you advance in the game. Each buggy has its own characteristics that you can modify in the Workshop. 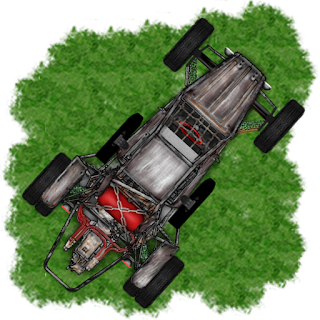 In the Workshop you will be able to modify the speed, the handling steering wheel and the brakes of the buggy. b- Moving the phone as if it were a steering wheel.